Or "Over My Head" would have been a cool title. I tried to embed 4 times for ****'s sake but both Instagram and Tumblr don't want to. The Harper's Bazaar photo is gorgeous!!!!!!!! This is the most beautiful photo I've seen of Christine yet this year! Gorgeous! IT is appropriate that Catherine Alcorn’s Go Your Own Way, a touring show looking at the life and songs of Fleetwood Mac rock band member Christine McVie, is being staged at Cessnock Performing Arts Centre. McVie, who was a vocalist, keyboard player and songwriter with Fleetwood Mac from 1970 until 1998, came out of retirement in 2014 to join other legendary members of the band in a global tour that included two sold-out shows at nearby Pokolbin’s Hope Estate in November, 2015. Ironically, when Alcorn first staged Go Your Own Way at the Adelaide Cabaret Festival in 2013, Christine McVie was repeatedly rejecting offers to return to performing and touring. Alcorn and the show’s writer, Diana Simmonds, have regularly got together to update it for capital city seasons and tours. What began as a 60-minute cabaret-style show is now a moving 80-minute musical that shows how the things that happened in McVie’s life affected the songs she wrote and performed. Catherine Alcorn is joined in delivering the songs by band members and background vocalists. Alcorn first showed her talents for putting together and presenting shows about well-known performers with The Divine Miss Bette, in which she stepped into Bette Middler’s shoes. It played to a sold-out audience at Cessnock last year. Go Your Own Way: A Tribute to Christine McVie can be seen at Cessnock Performing Arts Centre on Thursday, May 11, at 7.30pm. Tickets, $45 to $55, can be bought from the theatre box office, 4993 4266. The show includes many of Fleetwood Mac’s biggest hits, most of which were written or co-written by McVie. Her songs include Over My Head, Say You Love Me, You Make Loving Fun, Don’t Stop, Little Lies, As Long as You Follow and Songbird. The show’s title number is by Lindsey Buckingham. In her initial years with Fleetwood Mac, Christine McVie was often overshadowed by a more colourful female member, Stevie Nicks, even though many of her songs were among the group’s best-sellers. It was often her relationships that made news stories. Originally a member of the band Chicken Shack, she joined Fleetwood Mac after marrying its bass guitarist John McVie in 1968. The couple divorced in 1976, and she subsequently became engaged to Dennis Wilson of the Beach Boys, but they broke up before his death. Her second marriage, to keyboardist Eddy Quintella, likewise ended in divorce. It’s hardly surprising that her best-selling songs, including Got a Hold on Me and Love Will Show Us How, reflected what was happening in her life. Now aged 73, she and Lindsey Buckingham have a new album that will be released this year. thanks so much for sharing, glad to see Christine gracing the cover! is there an article that goes with the cover that anyone has access to? However I couldn't find anything, I guess we have to wait. thanks! it's weird, i couldn't find that instagram post anymore on @johnrussophoto. That's strange, I also can't see it anymore, I think it may have been canceled or delayed?! 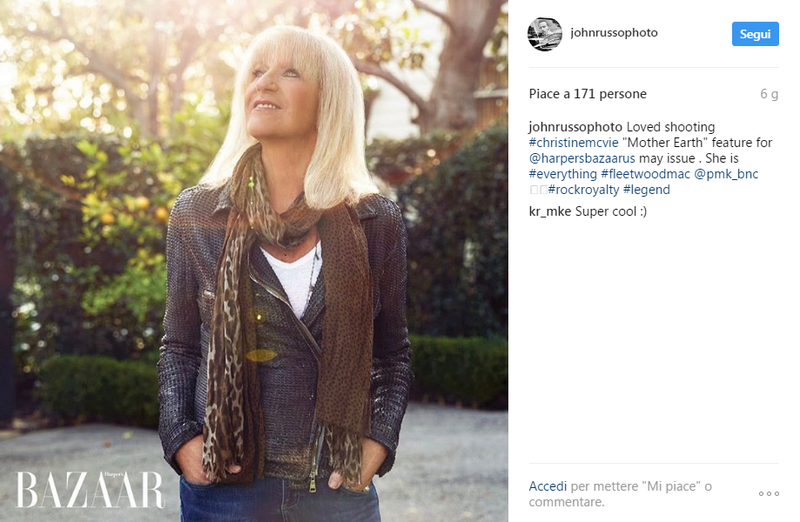 However trying to research I saw that further back John Russo has the picture of the cover for the Buckingham McVie album for which he was the photographer, and the clothes that Christine wears above look pretty similar to those she wore for some of the other pictures for that same shoot, so it's likely they're from the same photography session. It's possible that Harper's Bazaar just wanted them for an upcoming article or interview meant for the May issue but that for some reason couldn't be included at last (Christine canceled or postponed an interview? An article wasn't ready for the deadline for the May release?). I read it. It's a tiny article (literally a couple of sentences) nothing about the album. It just states that her flat in London has a garden on the terrace and that Stevie used to call her mother earth. Thanks. Who knows then why the Instagram post was deleted. Three years ago today, Christine McVie was the recipient of one of the most prestigious awards in the British music industry: the Ivor Novello Lifetime Achievement Award. When you consider how many hits McVie brought to the table as a member of Fleetwood Mac, it’s no wonder that she was honored in such a fashion. Indeed, with tracks like “Don’t Stop,” “Everywhere,” “Hold Me,” “Little Lies,” “Over My Head,” and “Say You Love Me” to her credit, it’s hard to imagine anyone looking at her name on the list of recipients and thinking, “Oh, I don’t know if this is really necessary.” In truth, the award was nothing short of a must. Taking the stage to claim her award, McVie offered her gratitude, of course, but at the time she also assured the assembled crowd that Fleetwood Mac was in the process of making another studio album, one which she reckoned would be out the following year. As it happens, McVie was being a bit optimistic – here we are in 2017, and there’s still no new Fleetwood Mac album – but we’re only a few short weeks away from finally seeing a portion of that promise come to fruition: June 9 will see the arrival of the first ever album by Lindsey Buckingham and Christine McVie as a duo. I remember this. She was starting to make the press starting in 2013. Haim’s second album might be titled Something to Tell You, but its breezy lyrical content (heartbreak, romance, romantic heartbreak) doesn’t exactly have a ton to say. That’s perfectly fitting, though, especially in an era when even the most frivolous pop stars seem determined to make (often misguided) political statements. By unironically embracing the lush sounds of ’80s soft-rock and ’90s adult contemporary, the sisters Haim (Este, Danielle, Alana) have succeeded at making the uncool cool, and Something revels in its retro cheesiness. But that’s what makes it such a fun listen: “Nothing’s Wrong” and “You Never Knew” sound more like ’80s-era Christine McVie-led Fleetwood Mac songs than McVie’s own recent album with Lindsey Buckingham; “Ready for You” has a soulful George Michael vibe with soaring harmonies and an anthemic chorus; the strings-driven “Found It in Silence” has a slight country-pop twang; “Kept Me Crying” shows off Danielle’s old-school guitar chops; and ethereal, minimalist album closer “Night So Long” evokes ’90s Sarah McLachlan. Through it all, the sisters balance their sharp musicianship with slick production and catchy hooks (although nothing’s quite as catchy as breakout hit “The Wire”). It’s a lovely, blissed-out pop throwback.